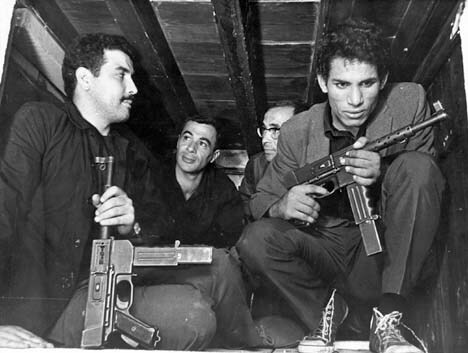 FLN resistance fighters huddle in building tunnels to escape capture by French forces. Gillo Pontecorvo’s Battle of Algiers is a war film with history behind it, much more so than even your average war movie. Its subject matter, the Algerian War of Independence from France, saw the rise of modern guerrilla warfare that would reemerge in war arenas all over the globe to the present day, including in the Vietnam War of the ’60’s and ’70’s, and most recently in the American Wars in Iraq and Afghanistan. The film not only inspired a large following of 3rd Cinema movements centered around themes of colonial oppression, independence, and leftist radicalism, but its release coincided with 20th century decolonization periods and national liberation wars across (soon to be former) European empires. The film’s documentary style cinematography and direction offer valuable commentary on the nature of urban combat, and was used as an educational tool by the Pentagon before the United State’s reconstruction of Iraq following the fall of Saddam Hussein’s regime. Consistent with his Italian neo-realism inspirations, Pontecorvo cast mostly non-professional actors in his ensemble cast. The lone notable professional actor is Frenchman Jean Martin as the French paratrooper Coloniel Mathieu. Martin offers an interesting character analysis of the brutal French response to rising violence and political dissent in Algeria’s later capital city of Algiers, demonstrating shrewd intelligence while also brandishing a coldhearted campaign of military discipline (including torture and targeted killings) that would ultimately prove futile in the face of Algerian determination. The Algerians themselves are portrayed as rough, hardened survivalists that use every sneak attack and trick in their arsenal to break down French authoritarianism. There’s a powerful scene early in the film where two female Algerian resistance fighters dress as Europeanized bourgeois ladies to pass armed French checkpoints and bomb a cafe full of police… as well as innocent bystanders. The film’s cinematographic style feels like it was filmed when the actual historical events took place. Pontecorvo emphasized aged film stock aesthetics and film grain to mimic the visual style of old newsreels and documentary footage. The effect lends authenticity to the narrative, but the visual quality of the frame grows tiresome as a result. The characters are in service of the war-torn narrative. This is a plot-driven movie rather than a character-driven one, and the thematic content of the violence and culture clashes speaks volumes more than the one-dimensional characters. The story and the way it’s directed are more integral to the movie’s success than the cast (including Martin), and those aspects of the film are well done. The film’s emotional and heavily symbolic conclusion is my favorite part for its implication of the history to come. Although Algerians had already won their independence well before The Battle of Algiers was even made, the powerful imagery of ordinary Algerian citizens (including men, women, and children) shouting at French military forces in huge crowds and waving Algerian flags long after the fall of the National Liberation Front (FLN) in Algiers, was huge writing on the wall for the rest of the colonized world. France may have won the Battle of Algiers, but they lost the war. Many of those then soon-to-be independent nations would continue to suffer from the shackles of post-colonial society, but for the time being, the violent conflicts and inevitable victories of peoples like the Algerians were immortalized by the works of Pontecorvo and 3rd Cinema filmmakers like him. Power to the People: Algerians congregate in the film’s finale and stand firm in their resolution for independence. 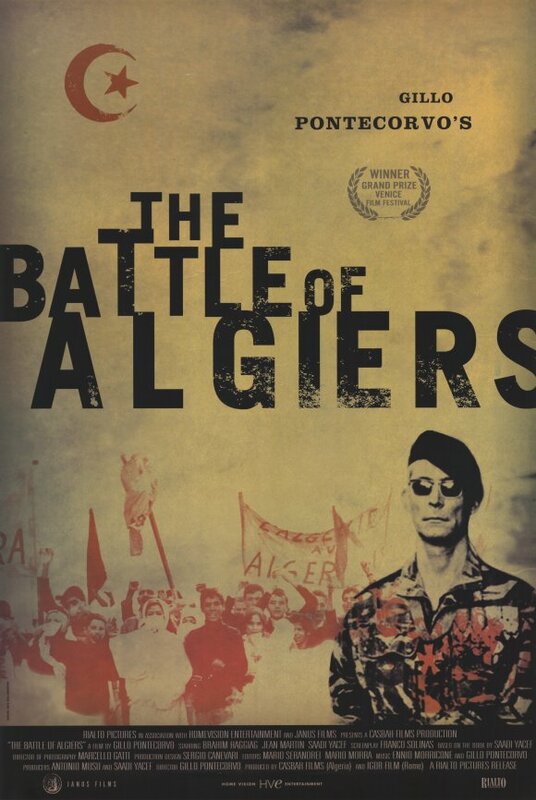 SUMMARY & RECOMMENDATION: The Battle of Algiers’ expansive screenplay and down-and-dirty direction covers much ground in a conflict that influenced the remainder of 20th century warfare. The film largely skimps on detailed character study in favor of a broader sociopolitical analysis of the complex dynamics of European imperialism. For all its graininess, Pontecorvo’s rough, documentary style lends a flavor of historical reality that few historical fiction films ever achieve. — However… the film’s lack of any captivating characters becomes tiring, as does the degraded style of the picture.
? Vive la revolucion, I guess.